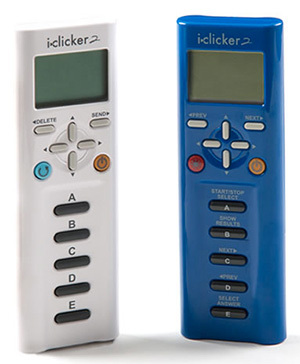 i>clicker is a portable, handheld device that lets you instantly provide feedback and answer questions during class. Instructors can use it to quiz and grade students, take polls, provide extra credit and more. Fun Fact: i>clickers were invented at the University of Illinois! Communicate with your instructor about which version of i>clicker you are expected to use in class. Purchase a new or used i>clicker from the Illini Union Bookstore, the i>clicker online store, Amazon or other websites. In order for your instructor to grade your answers from the i>clicker remote, it must be registered so that your name connects with the device. Note: You may register multiple remotes if you have more than one, or sell one and buy another later. Note: Also, one i>clicker registration at Learn@Illinois (Moodle) will work for all of your Learn@Illinois courses, but not for courses in Illinois Compass. If you have courses in Illinois Compass that use i>clicker remotes, you need to register your remote there as well. Go to your course website on Learn@Illinois. Locate the “I>CLICKER” block on the left hand-side of the course main page. Find your i>clicker remote ID. It is printed on a sticker located on the back of your remote. The ID is the 8-character code below the barcode. Some older i>clicker remotes have a secondary ID location behind the battery compartment, and i>clicker 2 remotes display the ID upon power up. The remote ID will only contain letters A-F and numbers 0-9. Type the remote ID into the text box next to “Enter Your i>clicker Remote ID” and click the Register button. All of the remotes you have registered at Learn@Illinois will then be listed. Note: Be sure to use your own remote during class. Using someone else's remote will not work unless you register it by following the steps above so it is connected with your name. Press the power button to turn on the i>clicker. Your instructor will present a question. If the answers are multiple choice, simply press the button for the letter of the answer you wish to select. 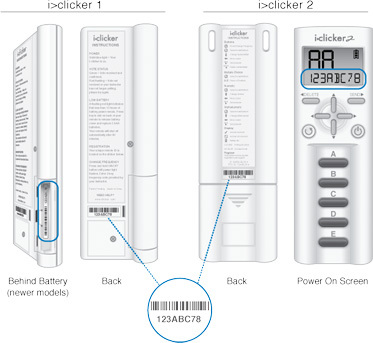 If the answer is Numeric or Short Answer, you can only answer with an i>clicker 2 remote. Press the refresh button to change the question mode and follow the guide printed on the back of the remote for the answer type you need to use. Once your answer has been successfully submitted, either a green light will flash (if you are using an older remote) or a checkmark will appear on the LCD screen (if you are using an i>clicker 2). If you try to answer a question after the instructor is no longer allowing answers, a red light will flash (older remotes) or a circle with a slash through it will appear on the LCD screen (i>clicker 2). If you encounter problems with registering or using your i>clicker, go back to your course site and in the "I>CLICKER block, click Student Registration. On the right hand-side of the screen will be a list of FAQs. You can also find help on the i>clicker support page. If you are unable to find solutions using the resources mentioned above, speak with your instructor or contact us.